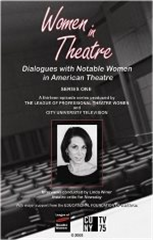 Produced by the League of Professional Theatre Women and CUNY TV, Women in Theatre: Dialogues with Notable Women in American Theatre is a unique television series that highlights the accomplishments of women on the American stage. Hosted by Newsday theatre critic Linda Winer. The Playwrights, director, designers, producers and performers interviewed on the programs encompass generational, disciplinary and ethnic diversity; they share their thoughts and vision, their career paths and professional choices. From the 52 interviews that comprise the four-year series, the producers have selected 13 for the initial set of DVDs of Women in Theatre, affording to a wider audience and unique look into the lives of some of the gifted women who create and sustain theatre in the United States. Interviews include Suzan-Lori Parks, Anna Deavere Smith, Wendy Wasserstein, Ruby Dee, Rosemary Harris, Audra McDonald, Elizabeth McCann, Carey Perloff, Heidi Ettinger, Julie Taymor, Jennifer Tipton, and Graciela Daniele, and a panel with Martha Lavey, Lois Smith, and Joan Allen from Chicago’s Steppenwolf Theatre Company.